The Blue Star container ship BRISBANE STAR passing the ENRICO COSTA on the landing stage. The containership BRISBANE STAR (27,305 tons gross) was built in Poland in 1978 as the French-owned LA FAYETTE. In July 1993, it was bought by Blue Star (North America) Ltd, registered in the Bahamas, and renamed BRISBANE STAR. In December 1997 it became SINGAPORE STAR and was owned by Blue Star Line Marine Ltd. This was around the time that Blue Star Line Ltd, the origins of which went back to 1909, was winding down, and in September 1998 the ship had been sold to P&O Nedlloyd, was registered in London, and renamed P&O NEDLLOYD LYTTELTON. 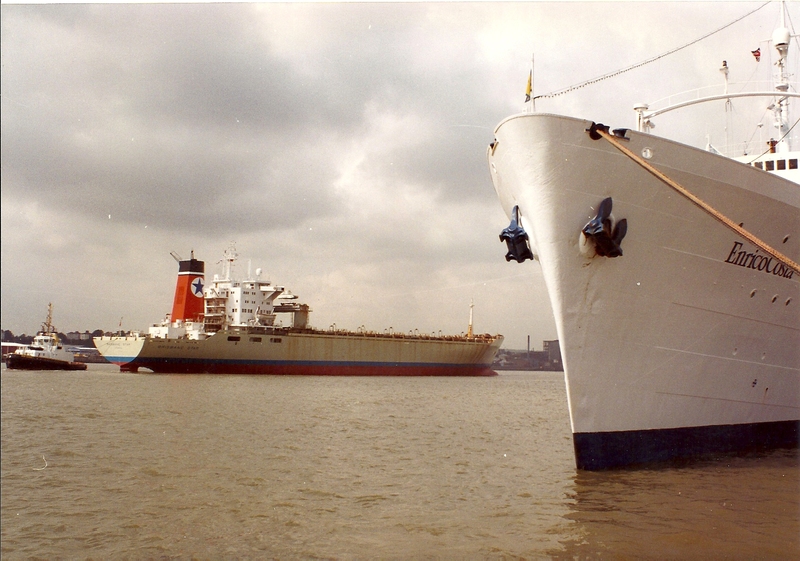 Blue Star Line Ltd with its containerships was sold in 1998 to P&O Nedlloyd. It was in service for just over four more years and was broken up at Jiangyin, China. 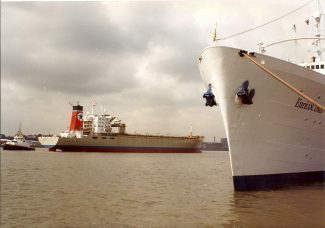 P&O Nedlloyd was in turn sold to Maersk in the earlier 2000s.